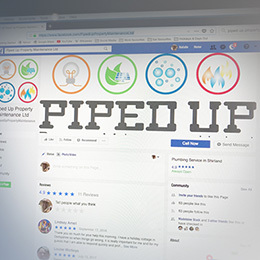 "I would like to thank Natalie for assisting in the rebranding of Piped Up. Thanks to her hard work and incredible design knowledge we now have a professional company logo, as well as logos for each sector of the business. After some careful thought and consideration Natalie came up with a number of different designs and ideas that she felt would work for our company and would complement the services we offer. She asked for our input every step of the way, the outcome is a brand we are proud to use to represent our company. I would highly recommend Gosh Golly but I would also recommend Natalie as a thoughtful and kind individual with a knack for gauging exactly what her clients want and need."